The world has lost one of its rare great statesmen, the World Economic Forum one of its true architects, and I myself a trusted mentor and friend. For over 25 years, Shimon Peres was engaged in making the Forum a platform for his tireless reconciliation and peace efforts in the Middle East. He was at the origins of our summits in the Middle East and North Africa region, starting with the Casablanca Summit in 1993. He was the driver of numerous efforts in Davos to build bridges between Israel and the Palestinian people, and he was the patron of our Break the Impasse Initiative . There are so many touching moments which are unforgettable and which became an essential part of the Forum's history in shaping our mission and culture. Shimon Peres was also a pioneer of the Fourth Industrial Revolution , a true visionary who was convinced that technology was a catalytic tool for creating not only a more prosperous, but also a more peaceful world. 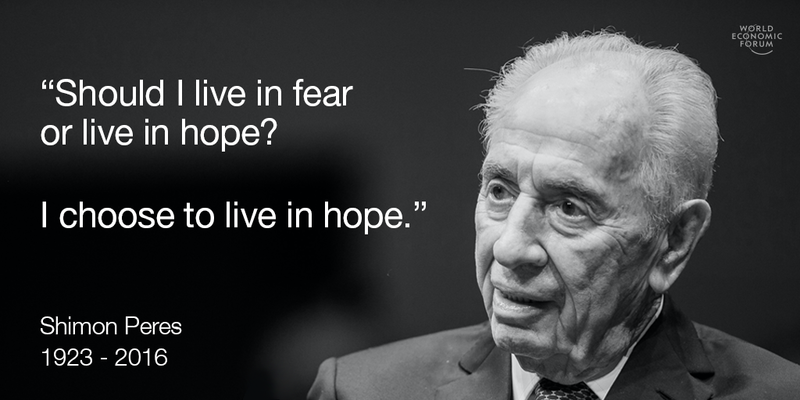 For all of us, Shimon Peres is a role model for always confronting the world with constructive optimism, believing in the best in others and giving his best. We will honour him by carrying his spirit further in what we are collectively and individually doing.